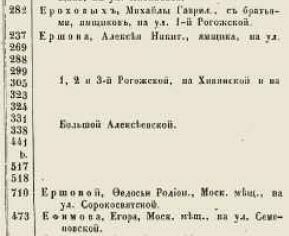 The 1861 register of the St. Sergius of Radonezh church records: "On November 23, Alexei Korovin, son of an Eysk merchant Mikhail Korovin, and his rightful wife Apollinaria Ivanova, both of the Orthodox faith, had a son Konstantin who was baptised on the 24th of the same month, godparents being Alexei Yer-shov, a coachman of the suburb of Rogozhskaya, and Vassa Mikhailova, wife of the Eysk merchant Mikhail Korovin. The sacrament of baptism was performed by the parish priest Simeon Pospelov and clergy. 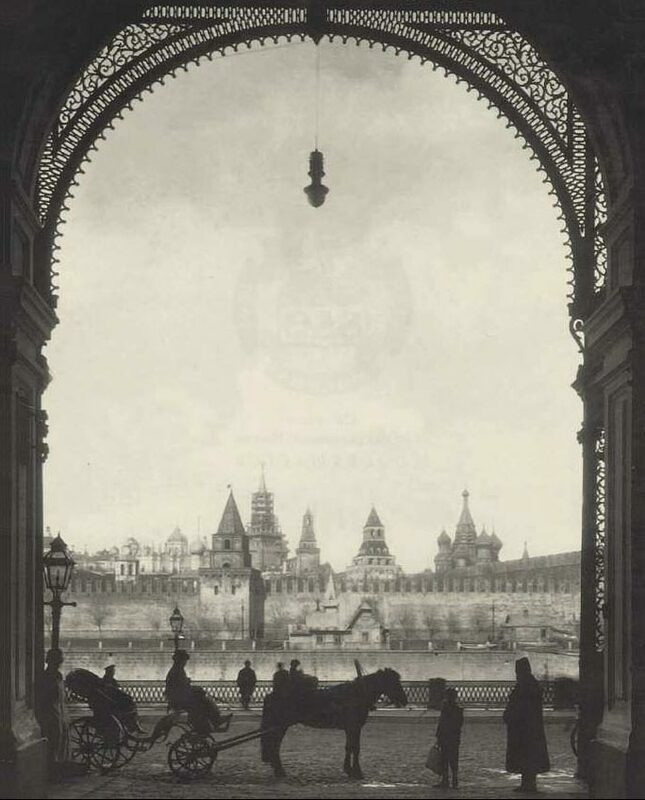 "1 However, historians do not yet know the exact place in Moscow, where Kon-stantin and Sergei were born. Some artists share the opinion that house No. 24 on To-varishchesky (former Durnoy) Lane in Moscow, close to the Surikov Art Institute, is the house where the Korovin brothers were born. However, the revealed facts testify otherwise. I remember my grandfather Mikhail Korovin — vaguely, but I do. A large hall, where he used to sit in an armchair, greyhaired, bent, tall as a giant. The room is in the empire style; above, on both sides, it has wide semi-circular alcoves and balconies with golden balustrades. On one of them, a quartet of musicians is playing. And my grandfather is sitting in his armchair and listening to the music (his favourite composer is Bach), his legs covered with a fur blanket (he is ill with gout), and he's got a handkerchief in his hand. He always listens to the music alone, never lets anybody in, apart from me, his seven-year-old grandson, and he cries as he listens to it. And I sit next to him, by his side, very quietly. I see him cry and believe that this is the way it should be. 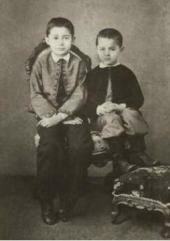 Konstantin Korovin was not to be buried next to his father: his remains rest in the Russian cemetery in Paris. Here are some more vivid details from his story "My Life": "I remember my grandfather's beautiful house on Rogozhskaya Street. A huge mansion with a large yard; behind the house, an enormous garden opening onto another street, Durnovsky Lane. Small wooden neighbouring houses, where the coachmen lived, also had spacious yards. The yards were filled with stables and coaches of different kinds, dormeuses and carriages, which served to carry passengers from Moscow to Yaroslavl and Nizhny Novgorod, along the roads that my grandfather rented from the government. "I remember a large empire-style hall with columns, and above, balconies and circular alcoves where musicians played at dinner parties. I remember those dinners with dignitaries, well-dressed women in crinolines, military men with decorations. I remember my grandfather — tall, in a long frock-coat, with medals around his neck. He was then a grey-haired old man. He liked music and used to sit in the large hall alone with a quartet playing above, and This lively picture makes one imagine a large house with a wrought-iron fence and a beautiful gate. 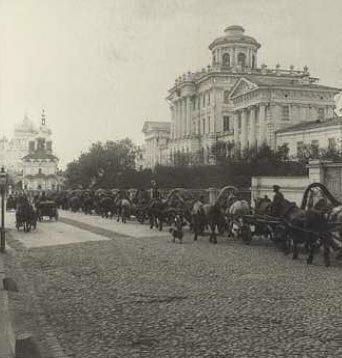 The only thing is, in those days there was neither Rogozhskaya, nor Great Rogozhskaya Streets in Moscow but 1st, 2nd, 3rd and 4th Rogozhskaya Streets. And no property on any of them could possibly open onto Durnoy (Tovarishchesky) Lane. And if one looks at the exact plan of Moscow published in detail on several sheets shortly before the artist's birth, one can clearly see that 1st, 2nd, 3rd and 4th Rogozhskaya Streets did not have any houses with gardens, even small ones. Only Great Alexeevskaya Street had properties with gardens opening onto Durnoy Lane. Most of the buildings on 1st Rogozhskaya, the former Telezhnaya (now Shkolnaya) Street have survived up to the present day. All the houses are made of stone and are built in the same way: shop premises on the ground floor, living quarters on the first, and in the middle of the house, a carriage arch leading to a narrow yard enclosed with shelters for household needs. No gardens or conservatories. Obviously, none of these houses looks like Korovin’s description of his grandfather’s house. We need to take another look at the town plan of those days. The houses and properties on Durnoy (meaning literally, “bad”, though Korovin softens that meaning by calling it “Durnovsky”) Lane show more variety; some estates do have gardens but their façades overlook Durnoy Lane and their backs, gardens and yards – 1st Proezzhy Lane. And, clearly, the house mentioned, No. 24, does not correspond to Korovin’s description. So, why does this belief that Konstantin Korovin was born in a small house on Durnoy (Tovarishchesky) Lane, and not on Rogozhskaya or Great Rogozhskaya Street survive? 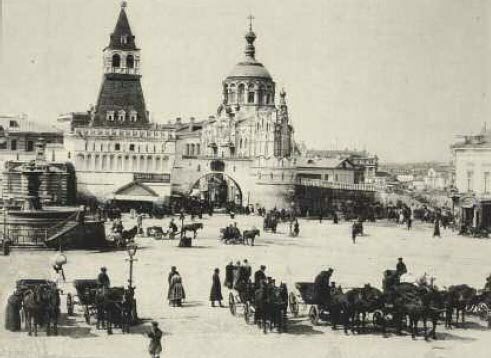 We know that there was neither Rogozhskaya, nor Great Rogozhskaya Street in Moscow in those days. But the only real estate related to the Korovins’ name in the Rogozhskaya area, and actually in the whole Moscow, was indeed situated nearby and was even adjoining that small house. 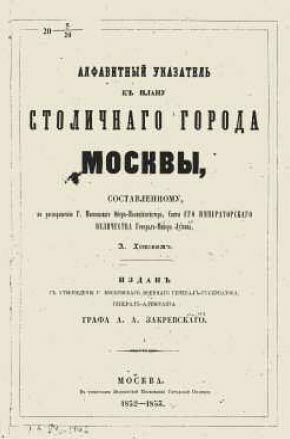 The 1853 “Index to the plan of Moscow capital city, made by A. Khotev by order of Moscow Ober-Polizeimeister Major-General Luzhin”, indicates a property of “Vassilissa Mikhailovna Korovina, daughter of a Bogorodsk merchant, on Durnoy Lane” in the Rogozhskaya section, page 160, No. 497, 498. On the whole, it is quite a large estate but narrow, zigzag-shaped and with a garden opening onto a lane, or rather on a waste ground being a continuation of a lane then named 1st Proezzhy. So, who is the Vassilissa Mikhailovna mentioned in the birth certificate of the newborn Kostya? She was his grandmother and, moreover, his godmother. As for their small house, in all likelihood, it was not there that the "dinners with dignitaries, well-dressed women in crinolines, military men with decorations"3 were held. Its first floor, today made of modern lime-sand brick, was wooden before. Obviously, this is not a mansion with a baronial hall! Many researchers would stop at this point, supposing that Korovin's childhood memories were not exact. That could have been the case had not Korovin lived in Moscow almost permanently until 1922. In his adult years, I believe, he had a chance to see his native places more than once — the places in the Rogozhskaya suburb where he had grown up, been baptised, and where the family graves were. It is common that memories of one's childhood remain very clear in one's old age. Perhaps, Korovin has mixed everything up on purpose, and if so, is it worth it finding out why he did it and where are the places where Kostya has first seen the beauty of the world and sensed the colours of life? I think that the house or the place where the house and the garden were located should be found, but the reason why Korovin mixed everything up in the Rogozhskaya suburb, can only be guessed at, but we should not dig too deep. The house that has survived until the present day had most likely belonged to the adjoining estate No. 496 owned by an Unter-offizier, Yakov Bogomolov. This can be proved by examining the lane's so-called "red lines". Very little remains from those days but the directions of streets' "red lines" stay the same. All the buildings at the end of a lane opening onto Dobrovolcheskaya Street (formerly, Khiva Street) survive today, where there was an estate belonging to a merchant named Fyodor Baulin on one side and a property belonging to the Bogorodsk merchant's daughter Avdotya Kononova on the other. 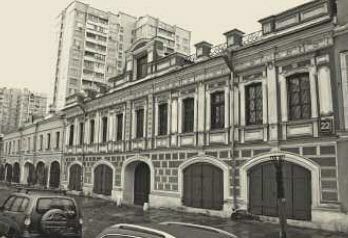 The property of Vassilissa Korovina was situated on the very bend of what was Durnoy Lane, opposite the still surviving house of a merchant Fyodor Streltsov's city estate (No. 520 on Khotev's plan). The absolute accuracy of any plan is open to question but an estate with a boundary line situated precisely on a lane's bend could not be displaced in any way on the map. Any mapmaker or land surveyor would always draw and check a map "from an angle". In addition, there is a later map called the "Appendix to the 1903 Address-Calender", where the remaining No. 497 indicates an estate that includes the former property of V. Korovina, enlarged with the estate of the Unter-offizier Bogomolov at the west end and a member of the Moscow middle class, Alexander Mironov, at the eastern end (No. 499 on Khotev's plan); the very same map shows Vassilissa Korovina's former estate also coinciding with the bend of Durnoy (nowadays Tovarishchesky) Lane. What is situated there today? Opposite the house of the merchant Streltsov's estate, on the very same bend of Tovarishchesky Lane, we have the west wing of the painting faculty of the Surikov Arts Institute, exactly where the estate of Vassilissa Korovina used to be. The estate stretched deeper into the block where today the Institute is located. 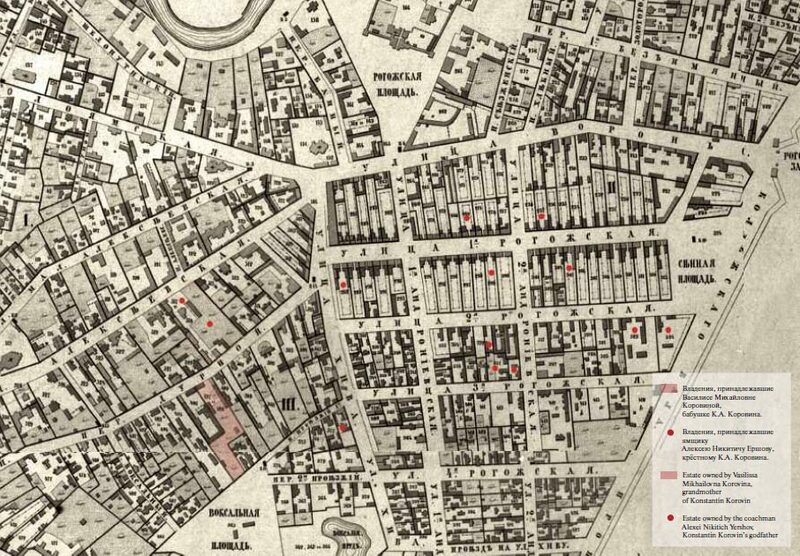 Everything has changed completely: none of Vassilissa Korovina's buildings remain — but the red lines formed by the remaining buildings both at the lane's end and beginning indicate the place with precision. Which means that the institute is located at the place of birth of the Korovin brothers, and it is absolutely certain that this is where the estate of their grandmother Vassilissa Korovina used to be. But that is not all — we have not found out yet whether it was here that the house described by Konstantin Korovin as his grandfather's was located. In theory, we have, but it is just that the artist, at the end of his life, having become famous, would not want to write in his stories that he had been born in Durnoy ("Bad") Lane, and "turned" it round, putting its fagade on the opposite side, on Proezzhy Lane. In the early 20th century it was no longer 1st Proezzhy Lane but Great Rogozhskaya Street or Lane, as different sources name it differently. Thus, everything seems to fall into place! And one of the houses on the estate that disappeared was that of Mikhail Korovin. But the problem is, the location of the buildings on the plot does still not conform to a huge empire-style Moscow estate in the description. "— Alexei's boy. You love him, Mikhail Emelyanovich. "They were talking about me. Here we come to the most interesting detail. First, let us try to figure out where Mikhail Korovin's estate described by his grandson could have been located. All houses similar to it could be situated only on Great Alexeevskaya Street. 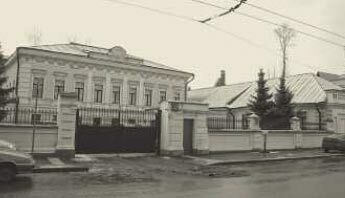 And one, probably, in Durnovsky Lane, where the school named after Shcherbakov (the former building of the Surikov Institute) and the Popular Outpatient Clinic (nowadays, the Museum of Culinary Art) used to be; but that estate belonged to a merchant, Nikita Prozumenshchikov, and was not related to the Korovins in any way. One estate with a garden on Great Alexeevskaya Street was owned by the Perlovs, famous tea merchants and honorary citizens, another by the Alexeevs, merchants and honorary citizens; it was there, incidentally, that another famous Konstantin — Stanislavsky — was born in 1863. While studying this, the question haunted me: how could it be that a rich merchant, renting the main roads to Nizhny Novgorod and Yaroslavl, to the Volga — then the major "artery" of the country, did not have any land or real estate in Moscow? 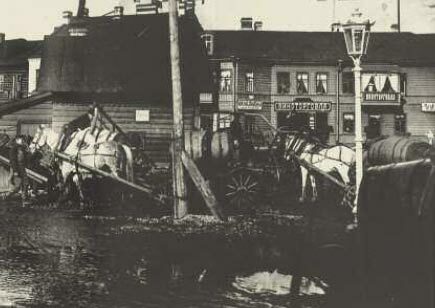 How come that the most important merchant in the Rogozhskaya suburb did not own any houses, stables or yards there? I realized that, in order to find the answer, I should look elsewhere, and decided to find out who was the main owner of the suburb, its "boss", so to speak. 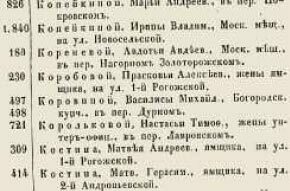 Leafing through the "Index to the plan of Moscow capital city" again, we find the major estate owner in the Rogozhskaya suburb. 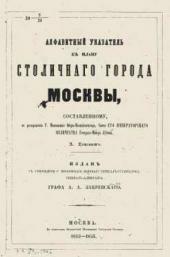 Page 157 mentions the owner of: "five stone houses with horse yards and shops on 1st Rogozhskaya and Khivinskaya Streets, two yards with houses and stables on 2nd and 3rd Rogozhskaya Streets, a plot of land opposite Pokrov Monastery, two enormous horse yards with stables and coachhouses by Sennaya Square, a huge city estate on Great Alexeevskaya Street, consisting of two domains and a garden", which seems to be the one described by Konstantin Korovin. It is hard to believe, but the owner of these twelve estates and one of the major real estate holders in Moscow is the "simple coachman" Alexei Yershov! We remember the line from the birth certificate: "godparents being Alexei Yershov, a coachman of the Rogozhskaya suburb, and Vassa Mikhailova". It was he who was godfather at the baptism of the baby boy Kostya, together with the latter's grandmother, Mikhail Korovin's wife. Being the godfather, he was more than family, one of "theirs", and in the mid-19th century and even more so in patriarchal Russia, that meant a great deal. Mikhail Korovin was an Old Believer, and Old Believers shunned documents and courts, giving instead their word as guarantee. In his story "My Life", Konstantin Korovin tells how merchants used to lend millions of rubles, simply chalking debts on a cellar wall. None of them doubted another's word! Besides, due to government persecutions, they used to conceal their assets and property, sometimes even transferring them to agents. It looks as if Mikhail Korovin registered all his real estate in the name of a good man, the coachman Alexei Yershov, who later became Kostya's godfather. Could that be the reason why the documents "misled" the researcher Nina Moleva? I believe this was the same reason why Mikhail Korovin, a son of a native of Vladimir province, became an Eysk merchant. 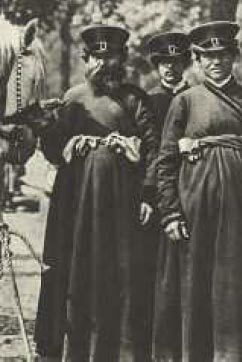 Under the rule of Nicholas I, economic pressure on the Old Believers increased. They could no longer join merchant guilds, and lost many mercantile privileges, in particular, the exemption of merchants and their sons from 25-year-long military service. This pressure made some of them convert to "Nikon's religion" — but not all of them, and some smart merchants found a solution. 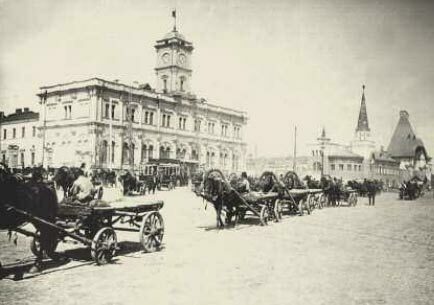 In 1848, the new town of Eysk was founded by the Azov sea. To make it develop faster, the Tsar offered the merchants considerable privileges, one being that Old Believers could join merchant guilds. 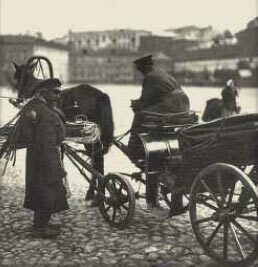 It was then that many merchants from Moscow and elswhere became Eysk merchants, Mikhail Korovin among them. Later, as Moleva attests, even for Kostya Korovin to enter the School of Painting, Sculpture and Architecture, a study permit had to be requested from the Eysk city administration, and this was granted to him, of course. Certainly, Korovin was not making things up in his memoirs when he described his grandfather's house and fortune. The house existed, as did the garden with the conservatory and the balcony with the musicians. His grandfather was rich and dealt in millions of rubles. Here it is, that city estate on Khotev's plan — the huge properties No. 317 and No. 318 on Great Alexeevskaya Street, opening onto Durnovsky Lane. Here is the garden with the "big yellow plums" and "a little gate in a wooden fence", almost opposite Korovin's grandmother's estate. But we encounter the same riddle again. We remember that Korovin says that he was born on Rogozhskaya Street — so why has Great Alexeevskaya Street become Great Rogozhskaya in Korovin's narrative? I'm inclined to explain it this way: Korovin gives us the real address of his birthplace, in other words his grandmother's house — that is where his young parents probably lived. And, as already stated, he would not tell in a work of literature that he was born in the ill-sounding Durnoy ("Bad") Lane, "turning" the estate's fagade towards Great Rogozhskaya Street. And his growing up and upbringing probably took place in his beloved grandfather's home, which might explain his description which also puts the house in its "rightful" grounds. "I saw that my father was upset and remember that he said to my mother that Echkin could not be trusted. — Everybody's deceiving me. I do not want to go to court, I loathe it. They do not have any honour.8"
And about the same thing in another story — "I'm ruined. Coachmen left.9"
We could finish our story here. The supposed house of the grandfather, heavily rebuilt, still adorns the street (Solzhenitsyn Street, No. 32), and two schools — one for general education and one for sports — are situated on the land where the huge garden with the conservatory used to be. It is a shame that nothing of Vassilissa Korovina's estate remains. But it is symbolic that, where it used to be, where the brothers Korovin were born, is located the painting faculty of the Surikov Arts Institute. The place where a great artist's talent originated, where he saw God's light, absorbed the melodious beauty of the world, from where he set off to find his "Cape of Good Hope", has for many years provided young artists with a home to develop their talent. 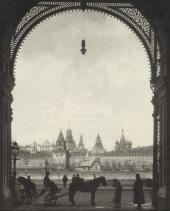 Russian State Archive of Literature and Art. Archive 680, op. 1, No. 754, sheet 6. K.Korovin. "That was long ago... There... in Russia...": Recollections, stories, letters. In 2 volumes. Vol. 1. Moscow: Russky Put', 2010. P. 215. K.Korovin. Op. cit. P. 27-28. K.Korovin. Op. cit. P. 28. N.Moleva. My Life is Painting (Konstantin Korovin in Moscow). Moscow. Moskovsky Rabochy, 1977.